I’ve been scrawling that over and over again, lately. A few years ago, and about five years after finishing my degree, I decided that I wanted to learn something again. I figured a language would be more useful than anything else and working in technology there were only really two useful choices: some sort of Chinese, most likely Mandarin, and Japanese. Knowing nothing much about China or Chinese culture, and being an avid consumer of Japanese books (a lot of Haruki Murakami, at the time) and video games (yes, I am a walking stereotype) I picked the latter. I signed up for a one year “Beginner’s Japanese” course at SOAS with two hours of tuition per week. I followed the course for a year, and it taught me a decent amount of (largely business-like) Japanese, along with how to read and write hiragana and katakana – the two alphabet-like kana scripts, rather than the pictographic kanji. I also learned a few other things, though, such as that I couldn’t really stretch to £300-plus-per-term courses on my salary at the time and that after working an eight hour day in the office my brain is pretty much incapable of writing English, let alone any other language. So, I passed the first year and then dropped out. Yay me. I figured I’d continue to study on my own, but this never really happened. For two reasons, I suppose: a lack of willpower and a problem with textbooks. SOAS uses a course called Minna no Nihongo, which is largely concerned with business situations and very focused on instruction in Japanese only – great with a teacher, but on your own it’s hard to work out which audio clips or exercises are which, let alone what you’re meant to be listening for or writing. 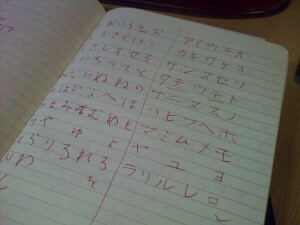 So, that was pretty much the end of my experiment with Japanese. Until last week. Last week Helen and I decided that, having not had a long holiday for three years, it was time to take more than two days away from work. I was briefed to look for relaxing beach holidays. I found myself looking at flights to Tokyo. Helen liked the idea. We’re going later this summer. Which leaves me a month or two to pick up the language again. No pressure. And, pleasantly, it’s been going surprisingly well. I was amazed to find that most hiragana characters had stuck somewhere in the back of my brain, and after a few days of practicing on the train I can now read and write both it and katakana again. I’ve also picked up a different textbook – Genki, which is apparently more modern, easier for English-speakers and less business-focused – to replace Minna no Nihongo, and I’ve found some PC-based flashcards that are quite good. And unlike the final months of my last course, where I felt like the daft kid at the back of the class who hadn’t done his homework (usually on press week), I’m enjoying the whole process of learning again. Of course, despite all this I’ll probably get to Tokyo and find that I can’t read, comprehend or say anything of use. But who knows – it’s worth a try.